Mena Boyah, a first year student, and Paul Santamore, right, a senior, sort through trash on South Street. 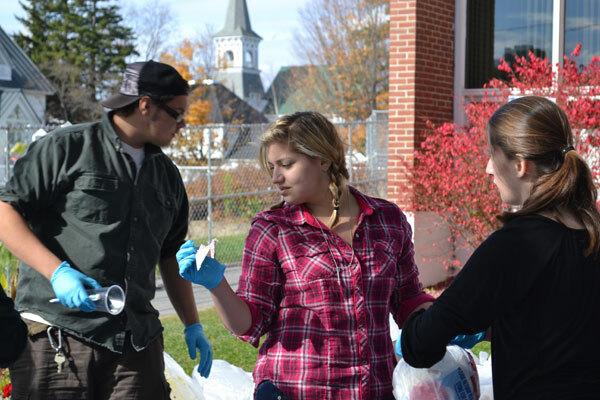 FARMINGTON - Curious students gathered just off South Street Wednesday morning, as members of the Sustainable Campus Coalition tore into trash bags after donning masks, gloves and their senses of humor. "Anyone care for a gingerbread cookie?" one student asked, holding up a rather battered specimen. 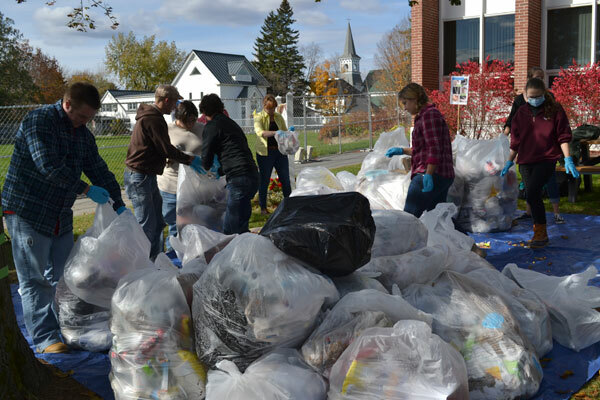 Trash Day has become an annual event at the University of Maine at Farmington. Organized to raise awareness about recycling, composting and waste reduction, the event consists of UMF SCC members collecting and cataloging all the garbage produced within a 24-hour period in the campus dorms. The process is staged in some well-traveled section of the campus, this year the tarps were laid out on the lawn to the south of Mantor Library, in order to draw public interest. Students sort out traditional recyclables from the garbage and, in recent years, also collect food scraps for compost. They also are able to sort out less traditional recyclables, such as certain types of plastics, for the TerraCycle program. A relatively new addition to the campus' environmental-friendly efforts, TerraCycle's goal is to drastically reduce the waste stream by creating national recycling systems for previously hard-to-recycle waste. Lucas Kellett, the campus' sustainability coordinator, said that he had seen improvement in the waste stream. Greater than 30 percent of the waste collected in previous Trash Days could have been recycled, he said, with that ratio falling into the mid 20s. "Generally, we see a positive trend," Kellett said. "The rates are improving." One of the bigger differences, Kellett said, was that incoming freshmen were showing up with greater awareness of the issue. Reducing the campus' overall waste production was particularly important, Kellett noted, given the budgetary constraints UMF was operating under. Creating a compost program, embracing TerraCycle and working with the local Sandy River Recycling Association, Kellett said, reduced the campus' tipping fee costs. First-year student Katie Beach holds a folded, paper crane she found in the garbage. 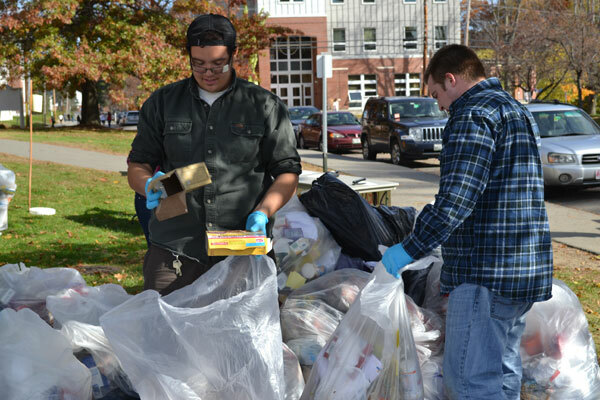 Trash Day has become a permanent fixture on the UMF campus in October.